I recently received a neat interior door installation kit that makes installing interior prehung doors a snap. The kit is from Innovative Construction Enterprises and is referred to as the “EZ-Hang Door Installation Bracket Kit”. See EZHangDoor to learn more. When installing an interior prehung door it is important to make sure the door is plumb and square in the door frame. If it is not, the interior door may not open and close properly and/or you may see wide and uneven gaps between the door edge and door jamb. Normally the process of making sure the door is plumb and square within the doorframe is a repetitive process involving the use of a level. As you continue to fasten the interior prehung door to the rough door frame you repeatedly have to keep checking with the level to see if the door is still plumb and square. The “EZ Hang Door Installation Bracket Kit” helps eliminate the repeated steps with the level. With the “EZ Hang Door Installation Bracket Kit” you start out by simply using a 4 or 6 foot level and marking a straight and plumb pencil line along the hinge side edge of the door opening. The mark should be approximately ½ inch in from the door opening edge, and on the drywall surface. After making the plumb line, you then fasten the EZ-Hang door brackets to the interior prehung door frame. Make sure not to remove the door latch plug when installing the door. On the hinge side of the interior prehung doorframe you apply one EZ Hang Door bracket just below each hinge and flush with the edge of the door frame. On the knob side of the door frame, you install one EZ-Hang door bracket 12 inches down from the top of the doorframe, another 2 inches above the latch hole, and another 6-8 inches up from the bottom. For doors wider than 30 inches, it is also recommended to install a 7th bracket centered on top of the door frame. With all the EZ-Hang door brackets installed on the door frame, you next slide the interior prehung door/doorframe into the door opening and align the hinge side EZ-Hang door brackets with the plumb line marked on the wall. There are a couple of reference lines on the EZ-Hang door brackets to help in properly aligning the door brackets with the plumb line mark. Once you have the EZ-Hang door brackets reasonably aligned along the plumb line, start at the top hinge side bracket and secure it to the wall surface using the drywall screws that come with the kit. The drywall screws will penetrate through the drywall and into the wall studs. Continue to work your way down the hinge side of the door, fastening the remaining EZ-hang door brackets to the drywall surface. 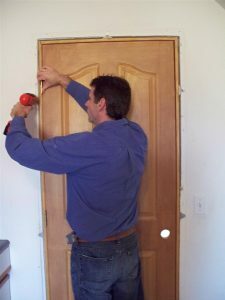 Next, make sure the spacing on the door knob side and top of the door frame are even and continue to secure the EZ-Hang door brackets to the drywall. Once you have installed the interior door to the door opening, you can then install some shims behind the hinge plates and near the door knob latch plate to stiffen up the doorframe. Use a finish nail along the inside door jamb to hold each set of shims in place. Finally you can trim out the door with door moulding. The door moulding goes directly over the EZ-Hang door bracket tabs that are fastened to the drywall. The interior door installation process is significantly reduced by using the “EZ-Hang door bracket Kit”, and more importantly, your door will be sure to work properly when opening and closing it. The cost of an “EZ-Hang Door Bracket Kit” is just a few dollars and it is well worth the investment. If you have interior door installation plans make sure to pick up couple of these kits when purchasing your doors.